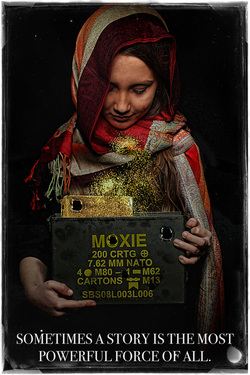 Moxie is the story of an unfinished, handmade book - compiled, written, and illustrated by an American marine and father serving in Afghanistan. The Book of Moxie becomes lost when the Marine is gravely injured, and the book then travels from war-torn tribal Afghanistan, to a chic yet dilapidated Parisian apartment, on to the slums of India, and finally lands in a gritty American inner-city school. Moxie not only inspires those who come in contact with it to share their own stories, but also acts as a reminder of the power of storytelling, the potency of words, and strength of the connectedness that we all share.